I'm not one to endlessly talk about how things were better when I was young. After all, I grew up without cellphones, the Internet, digital cameras, millions of TV channels and many of the other modern conveniences that we now take for granted. But I will say this. When it comes to railways, I miss boxcars. They used to be one of the more common types of rolling stock on any freight train. When I was younger, I recall seeing an endless assortment of boxcars pass through my hometown on the CSX freight trains. It wouldn't be uncommon to see CP Rail, CN, Central Vermont, Grand Trunk, Port Huron & Detroit, Chessie System, Louisville & Nashville, Seaboard Coast Line or Conrail boxcars on a train. Many of the cars were your standard boxcars (think of the once ubiquitous CN brown boxcars). But some would have ribbed exteriors and some would be impossibly huge, like this one below in the CN Sarnia Yard, used for auto parts. They almost always had interesting railways graphics and were very much the standard bearer for railways alongside the locomotives. Think of all the slogans Southern Railways used on its boxcars, as an example. I think the best thing about boxcars is how they add such a graphic element to railfanning. They still fly the flags of railways, both past and present, in a way that is somewhat lost today with the proliferation of containers and homogenous leasing company rolling stock. Here's a great example of what we have lost from an aesthetic point of view. This is an old St. Lawrence Railroad boxcar, in CP Rail's Windsor Yard in 1991. You can also see a Bangor & Aroostook boxcar in the background. Behind that boxcar is Detroit's Renaissance Center, home to General Motors' headquarters. I'm not saying I don't enjoy watching today's long container trains. I think, when taken as a whole, they are quite interesting to shoot, given their symmetrical dimensions and their mix of colours. This shot from the London CN Yard is a good example of the interesting visuals containers sometimes offer. But what I think we've lost as railfans is the ability to pick out individual cars in a freight train to shoot. There's always a cool boxcar worth grabbing in a photo, in my opinion. I have more boxcar photos than any other type of rolling stock. I don't have many individual wellcar photos, by comparison. There isn't much to cheer about if you're a railfan in Ottawa, but I will at least say that at least we do have a fair amount of boxcars still plying the rails here. I have snapped a few interesting ones over the years. This one I spotted in Walkley Yard, which made me think of the trains I watched as kid in Corunna. I like that there's a little stencil next to the door that says "A CSX Quality Car." Here's another cool shot of a string of boxcars early one morning at Walkley Yard. It's an image that could have been taking 20 or even 30 years ago. But, it's actually 2013. I'm always thankful when I catch an old boxcar on a passing freight. It's like watching a bit of history pass by. This one looked like it was hand painted. Have you noticed that most museums or tourist railways have lots of boxcars, like this one on the Waterloo Central? Railways today are great at what they do. But they are not nearly as colourful as they once were. Even though I know why boxcars are on the wane, part of me wishes they weren't. Boxcars are endlessly variable. (Except for the strings of 50-foot and 40-foot CN boxcars we used to see.) They are colourful. (Except for the strings I already mentioned). Boxcars can be coupled together and form different rainbows of colours at different times. And who knows what they're carrying. Perhaps the most interesting and colourful facet of boxcars today is the graffiti they hold (gasp!!). (Not supposed to legitimize graffiti!) Hey, how come so few containers have graffiti on them?? Anyway, thanks for boxing up your thoughts on boxcars, sliding the door shut on this post and sharing it, Michael. 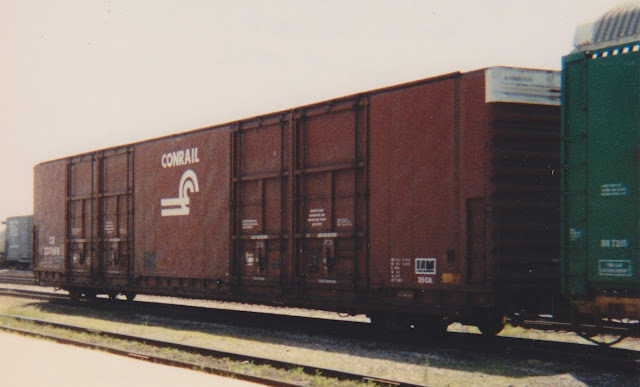 I actually do miss the IPD boxcars, Conrail-predecessor boxcars, shortline RR boxcars and the whole concept of loose-car railroading that boxcars represent. I think the reason I've gravitated backwards-in-time to the early 70's is: the mix of traditional boxcar red-era cars with the colourful 70's cars! On a related topic, there was two over height box cars on the Renfrew Spur this Wednesday. I don't know if any customers on that section of the who get boxcars. Definitely good news to hear that DaveM! I certainly feel for you in that it is sad to see so few boxcars these days. I lived a couple of years in Trenton around the turn of the century and was just down form the CP mainline in town. They often stashed a few boxcars there (and I mean stash - some of these were from the 40/50's and looked like they hadn't been moved since that time!) and as kids we would be down there checking them out every so often. Passing trains would always have a few sprinkled in. These days, as you pointed out, just containers. Containers have their own fun flavour, but aren't the same. Then again, all of this nostalgia is most likely the notion of things changing to the point where this no longer is commonplace and therefore desirable (flip side for containers where its almost boring to see them because they are so common). I will suggest the opposite of Eric though - I find most of the boxcars I see today to be littered in graffiti which is always disappointing (never did get the allure of going out after dark and painting things in the neighbourhood....). Thanks for the comments, gentlemen. Eric raises an interesting point. How come containers are never tagged but boxcars are constantly plastered with graffiti? I suspect it has to do with the fact that loaded well cars aren't left to sit in rail yards as boxcars are. Good info, Dave. I must say I am stumped as to why oversize boxcars are being left on the Renfrew Spur. Maybe there's some maintenance of way going on or perhaps a one-off delivery somewhere. 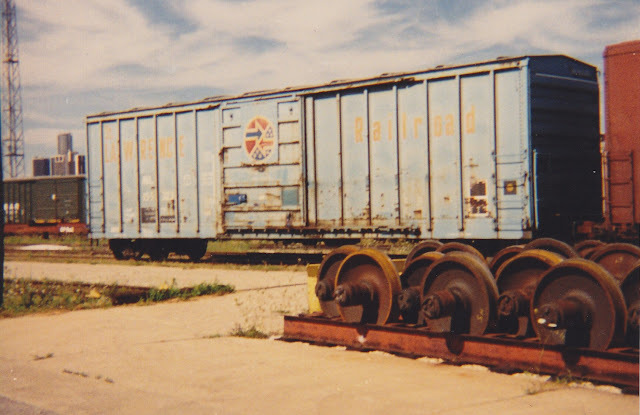 Boxcars are equally rare around Winnipeg. I'm glad we have variety with grain cars, at least. Steve - I recall your post not too long ago when you spotted an old Rock Island hopper on a train. That was classic! The car could have been filled with stuff required for track maintenance in Kinburn. The plant needed a delivery by box car. This is very unlikely, I've never seen a box car at that plant before. It was crazy cold that day, so perhaps they marshalled that car on to the train in the morning so that they could head straight back out of Ottawa on the Alexandria sub after Arnprior without having to stop in the yard and attach it. I'm thinking that 3 is probably the most likely. I too like boxcars, I don't see that many, but I do have a picture I took of a Southern boxcar on the Alexandria Sub a few years ago.